Home / Blog / Sneaked or Snuck? “Completely appalled”? “Egregious”? Please. I find her inclusion of H in IMHO rather ironic in this situation. Where does she get her definition of “substandard English”? Who sets those standards? Look, I don’t take issue with her perspective as much as her tone. We all have our opinions and preferences. If she prefers sneaked to snuck, fine. But why cast aspersions on those who like snuck? Who cares? I was unable to validate her claim that snuck originated with Huckleberry Finn. It’s possible, but so what? Sneak, it turns out, was a coinage of Shakespeare (who else?). It immediately took on a regular past form — sneaked. But in the 1800s, some Americans, including Huck I guess, started saying snuck. It was considered non-standard, colloquial usage for more than a century, but how long does a word have to be in circulation before experts acknowledge it? Most dictionaries are now saying it’s time to bend to popular usage. That’s how it works with English, remember. We don’t have an authoritative body like the Académie Française, which determines official rules of diction and grammar. Our “system” is organic. Various dictionary makers convene periodically to discuss changes to the language. They tend to be cautious about accepting jargon and slang, but when a word endures popularly for enough time, they appropriately give it the nod. Over time, we come to a general consensus on what is “correct.” It’s just that some issues are debated longer than others. By the way, here’s the data on sneaked vs. snuck. A Google search of the two shows 4.9 million results for sneaked and 10.5 million for snuck. So, online, people use snuck more than twice as often. Isn’t it paradoxical to say that two-thirds of English speakers prefer the “substandard” usage? Snuck sure seems pretty standard to me. But that’s online. What about in print? Publications still favor sneaked, but as you can see in the graph below, snuck is sneaking up on it, and has been for a few decades. My advice is simple. In formal writing, stick to sneaked. Informally, use whichever you prefer. Does bad grammar infuriate you? Or are you more concerned about the critics themselves? How about “wung” instead of “winged”? Before you criticize think about whether you use “rung” or “ringed” or how about “swung” or “swinged”. I’ve often heard my children say “I totally wung that!” referring to a test, project, speech, etc. My linguistics professors talked about the normal tendency in English is for words with irregular forms to change over the years to become regular, especially the low frequency ones. This makes sense – some child doesn’t hear the irregular form enough to learn it and uses the regular. Now fewer people are using the irregular. Enough children, enough generations, and the irregular form becomes archaic. “Snuck” is the only one they knew about that was becoming/had become irregular. I immediately decided to help it along as much as possible. I hadn’t thought about that, Marie, but it makes perfect sense. 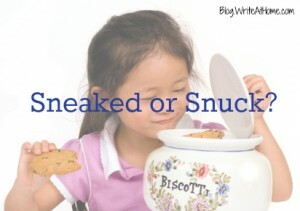 “Snuck” is an example of English moving in the opposite direction. Interesting. Thanks for the comment.